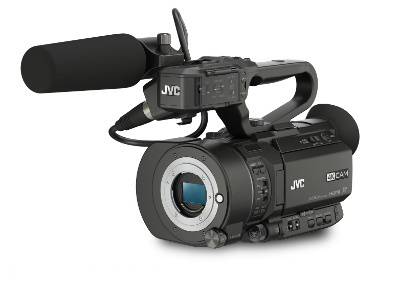 After its introduction and a press release from JVC a couple of months ago, we haven't heard much about this camera. With its Super 35mm sensor, micro 4/3 interchangeable lens mount, UHD/30p or UHD/24p recording, internal 4:2:2, dual card slots, 3 built in ND filters, shotgun mic, XLR jacks, top handle and camcorder form factor, the LS300 has remained a tantalizing prospect. This was especially true since JVC priced it at just $4450, the lowest price point ever for a Super 35mm "4K" camcorder and only about $500 more than it would cost to buy a $3297 GH4/YAGH combo plus the $599 Metabones Speed Booster/Focal Reducer the GH4 needs in order to mimic a Super 35 crop. With a GH4, however, you would still need to buy the top handle, ND filter and mic. And dual card slots are not an option. That said, we have seen impressive 4K video from the GH4 - but we have had no idea what kind of images the LS300 would produce - and JVC wasn't talking. Well, that's starting to change. JVC announced a few days ago that they would take the LS300 to Sundance this week to show it off to independent filmmakers - and rental house Delimex in Belgium has the camera in stock and has produced a slick narrative style short to promote it. Sadly, the clip is downscaled to 1080p HD, so we don't get the full benefit of Ultra HD - and there's not much motion, so we can't tell whether the sensor has a challenge with CMOS skew - but the skin tones look natural, the blacks seem to hold up in low light and the bokeh is gorgeous. This is the first JVC camera that looks to be competitive with sub-$10,000 large sensor, interchangeable lens 4K/UHD camcorders from Sony, Blackmagic, Aja, and Kinefinity. And its feature set and UHD resolution make the $4499 1080p-only dual pixel Canon C100 look overpriced. Note that Panasonic is MIA from this list. Unfortunately for Panasonic, since Sony's NEX-FS100 trumped their AG-AF100 back in 2010, the company seems to have ceded this market to its competitors. With the introduction of the Varicam 35, GH4, FS1000 and LX100 in 2014, Panasonic is now competitive at both the low end and the high end - but they left a huge gap in the middle, and JVC has driven through it with a truck. It is long past time for Panasonic to replace the aging AF100 with a modern large sensor camcorder - but the market will not wait for them. Personally, I'm saving my nickels for a sub-$10,000 4K Super 35 camcorder, and right now, the LS300 is one of the top contenders, along with the $5995 Blackmagic URSA and its global shutter. And for the latest deals, news, tips and techniques, please follow HCR on Blogger, Twitter and YouTube and circle us on Google+.